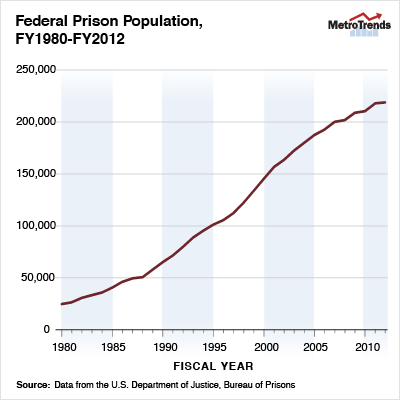 Over the past three decades, the federal prison population has grown dramatically. In 1980, fewer than 25,000 Americans were incarcerated. Today, that number has increased to 219,000, due to more—and longer—prison sentences for those who break federal laws, particularly drug offenders. This growth is unsustainable. For one, managing a prison population of that size is costly. 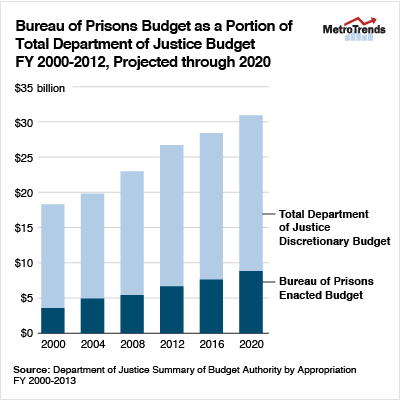 The federal Bureau of Prison (BOP) system’s budget request for fiscal year 2014 is $6.9 billion, which would consume more than a quarter of the Department of Justice’s entire budget. Assuming no meaningful changes in policy, that share will be close to a third in a few short years. This continued funding of BOP will come at the expense of other pressing public safety activities. Second, overcrowded federal prisons are dangerous, posing safety risks for staff and prisoners alike. And limited space means fewer places to offer much-needed educational and drug treatment programs that are crucial to prevent reoffending. This isn’t just a money issue, it’s a public safety issue. So what can we do to tackle this expensive problem and reduce the flow of prisoners? Today, the Urban Institute released “Stemming the Tide: Strategies to Reduce the Growth and Cut the Cost of the Federal Prison System.” In it, we review a number of options for cost-cutting reform to slow future growth and ease current overcrowding, including many that correspond to bipartisan legislative proposals. The bottom line? No one measure alone will do the trick; success will require a combination of both sentencing and early release policy changes. According to the research, lengthy drug sentences have been the major driver of the increase in the federal prison population. The single biggest way to make a dent in the prison population is to lower mandatory minimums for drug offenses. Cutting mandatory minimums in half could save almost $2.5 billion in 10 years. This measure alone would reduce overcrowding to the lowest it has been in decades. Thanks to the “Safety Valve,” mandatory minimums aren’t always totally mandatory. Judges have the option to exempt certain drug offenders from mandatory minimum sentences if the offender has a minor (or nonexistent) criminal history. If a new Safety Valve were available to all offenders facing mandatory minimums, it could save $835 million over 10 years, while stabilizing dangerous overcrowding. Most federal prisoners currently serve more than 85 percent of their prison sentences. Lowering the minimum amount of time served to 75 percent could save $1 billion over 10 years. Right now, the Fair Sentencing Act of 2010, which increases the quantity of crack cocaine needed to trigger a mandatory minimum sentence, only applies to cases brought to court after its enactment. But if it were retroactive, about 3,000 prisoners would be eligible for immediate release. Most state prisoners have more options to reduce their sentences for good conduct and participation in activities or programs—and early release has not significantly affected their likelihood of committing crimes once they’re out of prison. Several proposals would grant additional earned time to federal prisoners, varying by programmatic requirements, eligibility, and the extent of the credit; for example, providing credits for intensive programming could save $45 million. Granting earned time for a broader set of programs could save $224 million, while putting low-risk prisoners who complete programming onto home confinement could save up to $112 million depending on contracting conditions. Will any of these strategies completely fix all of the problems with federal prisons? In short, no – but the right mix of reforms could save money, substantially alleviate overcrowding, and improve the programs that keep prisoners from re-offending. The Sept. 2011 online issue of The Prison Journal (see sagepub.com/tpj) brought together articles by leading criminologists on evidenced-based research and strategies to address the 'prison boom.' Further, lobby efforts were directed toward getting Congress to pass Sen. Webb's bill to form a Commission to study US criminal justice system reform. Thank you for this important research and policy initiative.